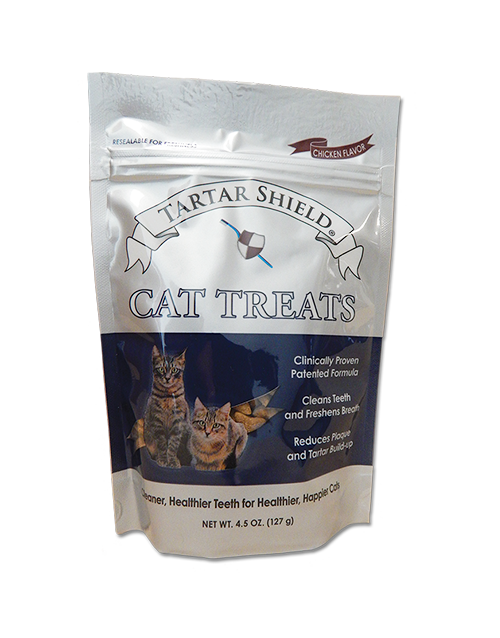 For cleaner, healthier teeth and gums reward your cat with Tartar Shield Cat Treats. Each tasty morsel contains malic acid, a naturally occurring ingredient found in citrus fruits. The patented formula is clinically proven to help clean teeth, freshen breath, reduce bacteria, and prevent plaque and tartar build-up over 40%. Malic acid also acts as a flavor enhancer, making Tartar Shield Cat Treats a tasty treat your cat is sure to love! 4.5 oz. Package. For cleaner, healthier teeth and gums reward your cat with Tartar Shield Cat Treats. Each tasty morsel contains malic acid, a naturally occurring ingredient found in citrus fruits. The patented formula is clinically proven to help clean teeth, freshen breath, reduce bacteria, and prevent plaque and tartar build-up over 40%. Malic acid also acts as a flavor enhancer, making Tartar Shield Cat Treats a tasty treat your cat is sure to love! Tartar Shield Cat Treats were clinically proven to significantly reduce tartar build-up through independent research conducted at Indiana University School of Dentistry. Studies showed that cats treated with malic acid, which is present in Tartar Shield Cat Treats, had over 40% less tartar build-up than those not treated with malic acid. 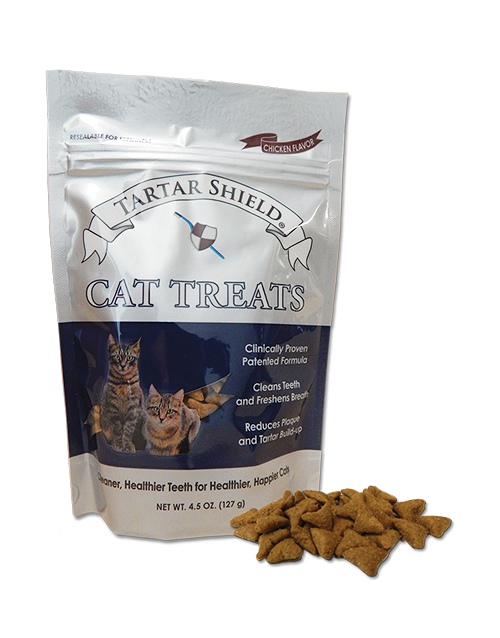 Give your cat Tartar Shield Cat Treats as a tasty treat or reward. To help keep teeth clean and reduce tartar formation, feed 10 to 15 pieces daily in addition to a normal diet. Each piece is one calorie! Tartar Shield Cat Treats are a wholesome treat, fortified with essential vitamins and minerals in a tasty chicken flavor. 4.5 oz. Package. 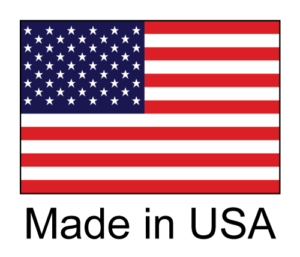 Whole Ground Corn, Chicken By-Product Meal, Wheat Flour, Corn Gluten Meal, Soybean Meal, Rice, Poultry Fat (Preserved with Mixed Tocophersols), Natural Poultry Flavor, Salmon Meal, Brewer Dried Yeast, Malic Acid, Calcium Carbonate, Salt, Potassium Chloride, Vitamins (DL-Alpha, Tocopherol, Acetate, Niacin, Vitamin A Acetate, D-Calcium Pantothenate, Riboflavin, Thiamine, Pyridoxine Hydrochloride, Menadione, Folic Acid, Vitamin D3, Biotin, Vitamin B12), Taurine, Choline Chloride, Trace Minerals (Iron Sulfate, Zinc Oxide, Manganous Oxide, Copper Sulfate, Cobalt Carbonate, Ethylenediamine Dihydroiodide, Sodium Selenite), Preserved with Mixed Tocophersols, a Natural Source of Vitamin E. Made in the USA with US ingredients.